A reader of my blog alerted me to The Shopping Sherpa blog which features some wonderful modern miniature scenes. The friendly and humorous blog author, Anna-Maria, is quite crafty and resourceful as she gives you tips on how to make and find modern minis. The picture above attests to her skill. 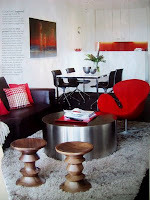 The first picture is from a Home Beautiful magazine that inspired her work in miniature that is in the second picture. Cool stuff! In addition, she hosts a Flickr Group called Modern Miniatures where you can see more of her work. You can join the Flickr Group and share/post pictures of your mini modern scenes. As soon as I get myself organized, I plan on posting a few pictures there.